What kind of overly polite Canadian would I be if I didn't give a tip of the hat to our neighbours down south today? As Independence Day is here, I have to tout the travel awesomeness that is the United States. It's definitely an underrated travel destination, and was the spark that made Ted and I fall in love with travel on our first international trip 5 years ago – our honeymoon (thanks guys!). The U.S. also happens to be home to one of our favourite cities to explore – New York City. New York is without a doubt one of the few iconic places that actually feels as epic and intoxicating as it's portrayed in the movies. Without further ado, here's tips to exploring this semi-pricey city on the cheap. Happy 4th of July! Flights and accommodation are arguably the biggest expenses on any trip to New York City and is where you should trim your spending most. Luckily, NYC is internationally a major flight hub, with sale fares from around the world appearing all the time. Use Airfarewatchdog to track these sale fares going in and out of NYC, or use Skyscanner to search for flights from your own city. For more tips on cheap flight booking, check out our article How to Book the Cheapest Flight Possible to Anywhere. Take note, if you're two or more people, hostel dorms often aren't your cheapest option. You can get a private room in an apartment via services like AirBNB (or even a private room in a hostel) for fairly cheap, so it pays to research in advance. When you can, book ahead. NYC is an expensive city – do not try the “wait and see” approach on accommodation! Note: we've done both Hotwire mystery deals and AirBNB and had great experiences with each. We loved sharing an apartment with our AirBNB hosts (a dancer & a model – does it get more NYC than that?!) in a gorgeous high-ceiling apartment in a neighbourhood oozing with character. We've also scored a great hotel in the financial district downtown. Both very different and fun NYC experiences! Times Square – one of my favourite free sights to wander and people watch! If you're dropping dollars in New York on attraction after attraction, you're doing it wrong. There are SO many free iconic sights to enjoy here, that you needn't be haemorrhaging cash just to “see” the city. Not to mention, it is quite walkable, though when your legs tire, simply give 'em a rest and make bounding leaps on its well connected public transit. Times Square – be sure to go at night to take in its neon buzz! If you're flexible with which shows you see and when, you can save as much as 50% off on same-day tickets both for on and off broadway shows. Simply show up at the official Last Minute Ticket booths to see what is playing that night. We've done this on two visits, the first time we saw Avenue Q (AWESOME! ), and in the fall we saw Chicago (to be honest, we didn't enjoy the October broadway rendition of this play). Note: free days/times subject to change – check attraction websites to confirm free days/times before your visit. A comprehensive list of museums that are always free or have discount days can be found here. Current free exhibitions and show listings that are temporary can be found here. 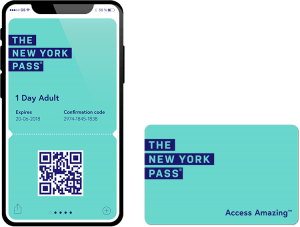 City passes don't always equate to savings, but if you're hitting up several big-ticket attractions in NYC, the New York Pass can definitely be cheaper. Starting at $94 USD, it's easy to calculate if this pass will cut costs for you as it provides free entry to 100+ attractions priced at $25-$35 USD per visit. The Empire State Building, the Guggenheim Museum, Museum of Modern Art, and Rockefeller Centre are just some of the sights included. You even get Fast Track entry to many attractions, letting you skip the line and see even more on your trip. We recommend using the mobile option, letting you instantly download your pass to your phone without having to pick up your pass or wait for it in the mail. The Metropolitan Museum of Art is pay as you wish for New York State residents and New York, New Jersey and Connecticut students. Otherwise, $25 for adults and free for children 12 and under. It's also included in the New York Pass, which will save you money if you visit a few attractions. Highly recommend! Nighttime views of the memorial at the 9/11 Memorial Museum which we visited on its free admission Tuesdays after 5PM. Though the line was long, it moved quickly. If you’re interested in the tragic events that unfolded on 9/11, this is highly recommended. TimeOut is my favourite resource for current free events and shows. Throughout the year there's always festivals and events going on. Be sure to check and see what's happening on your visit, or you could be missing on some serious fun – NYC is ALL about arts, creativity and events! Last fall we stumbled on this epic party under the Brooklyn Bridge – completely free and filled with pumping tunes and beer on tap (charge). Groupon and Travelzoo are GREAT for bargains when you do want to dine out for a nicer meal. We did this multiple times for a nice pizza & beer dinner and other meals out, I highly recommend at least checking. Hot dog stands are common throughout the city, though I don't recommend this (or pizza!) as a staple sustenance on your trip. (Papaya King is a definite mentionable though). Do a DIY $1 Chinatown eating walk – we did this & it was a great way to tour and “sample” an array of Chinatown's $1 snacks! Tip: If going out for a big meal, go out for lunch instead of dinner where possible, as it will be cheaper & lunch specials are common. Chinatown – a fun place to explore riddled with snacks. Egg tarts, dumplings, wonton soup, and mini waffle cakes being a few of our favs! TimeOut's DIY $1 Chinatown walking tour is pretty fun (albeit a bit confusing at times). What tastes better than savings?! Even if you don't have access to a kitchen (or simply don't want to cook, understandable for short trips! ), it's easy peasy to buy ready-to-eat goods on a 5-minute visit to a grocery store! Breakfast: we always bring a coffee filter, portable mugs, and a small bag of coffee so we can brew our own java each morning. We also try to buy room-temp foods like fruits or muffins that we can keep in our room & eat each morning if we don't have a fridge. Lunch: we usually carry a small utensil set or spork, so we can easily pop into grocery stores and grab foods like yogurts, sandwiches, hummus & carrots, cheeses, breads and such on the go. It at least leaves the option of a picnic anytime. We bring refillable Platypus bottles to curb waste and senseless dollars on water bottles. Fountains are plentiful in NYC, in fact someone has even mapped them out here and the city has a free fountain locator app! NYC happens to have some of the best picnic spots in the world. Put simply, it's pretty darn easy to grab some take-away food and enjoy scenery on a wooden bench just about anywhere. This can save big since you must remember, all restaurant meals will include an additional include tax and tip on top of the menu price! And there you have it, some quick tips for seeing this epic city on the cheap. A big thanks to our American friends for having such an awesome country to travel in, and a happy 4th of July to all! Have you done NYC on the cheap? What tips do you have to share?